A Dalek fleet surrounds a lone rebel ship, and only the Doctor can help it now. With the Doctor facing his greatest enemy, he needs Clara by his side. Confronted with a decision that could change the Daleks forever, he is forced to examine his conscience and ask himself whether he is truly a good man. Peter Capaldi is the Doctor in Into the Dalek. When Patrick Troughton took over from William Hartnell, his first full-length story was the sadly lost to time The Power of the Daleks. Since then, every Doctor with the exception of Paul McGann (who does get his chance in Big Finish with Dark Eyes) has encountered the Daleks in dramatic fashion. The Third Doctor experiences some of the series’ most complex time-travel shenanigans in The Day of the Daleks. “Do I have the right,” the Fourth Doctor asks in Genesis of the Daleks. Jubilee, one of the best audio Big Finish has produced, sees Six encounter the true evil of humanity via a Dalek in a story that directly inspired the Ninth Doctor story Dalek. 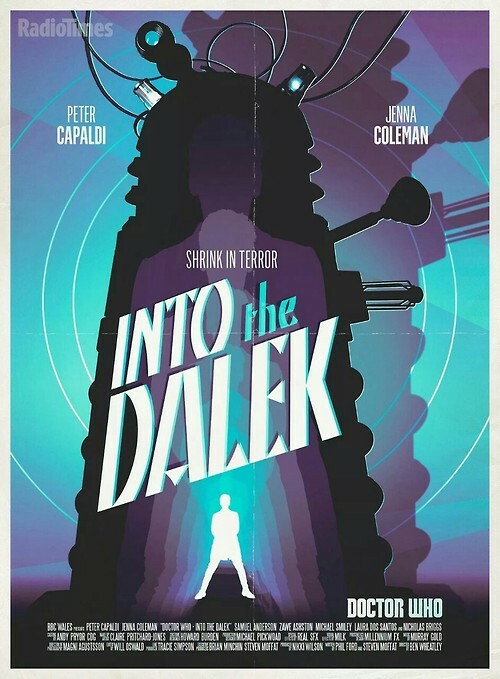 Into the Dalek is just that; a journey into the very heart of a living Dalek to see what makes it tick. The story suffers from a pair opening and closing bookends suffering from crushing heavy handedness and a series of incredibly uninteresting supporting characters. But Peter Capaldi and Jenna Coleman are once again superb, with Capaldi defining the character of his Doctor in a way that is both anathemna and intriguing for modern viewers and Coleman, in her final season, finally working with material that makes her character interesting. And, of course, there is the ever threatening presence of the Doctor’s most deadly foe. Can there be such a thing as a “good” Dalek? After thousands of years and the deaths of billions of sentient beings at the hands of the genocidal race, the Doctor isn’t convinced that a damaged Dalek, found floating in space by a ragtag group of resistance fighters, is capable of being anything in the moral ballpark of “good.” But he is willing to give it a chance, with the assistance of Clara. The pair, along with a trio of soldiers, are shrunk down and inserted into the Dalek’s casing. Is this Dalek nothing more than a genetic anomaly, an abomination against its own kind? Or has something happened to fundamentally change the very nature and thought process of this Dalek? The idea of a “good” Dalek is nothing new to the series, classic or revival. Where Into the Dalek succeeds is in its delivery of discovering just WHY this Dalek has turned against its very nature. The script for this story was penned by two people; Steven Moffat himself, and Phil Ford, whose previous contribution was the Tenth Doctor special The Waters of Mars. It’s very easy to see which parts Ford worked on and which parts Moffat contributed. The concept of actually going inside a Dalek’s armor casing and seeing its biology is wonderfully done in terms of both design and execution. With shrinking down the Doctor and Clara, Ford’s script lets the production team cut loose, as the set design was some of the best in the revival so far; a mix of hard metal and squishy organic parts, complete with an immune system that’s electronic vs. biological, specifically the trip through the Dalek’s eyestalk, with its trippy, wavy look straight out of the 1960’s. The Dalek’s robotic look is iconic, but viewers get to see just how much of the hatred the Daleks cultivate is organic and how much is forced upon them by electronics. The Doctor has referred to the Daleks time and again as the ultimate evil, but it’s their cortex that enhances certain emotions and memories and suppressed others. “This is refined evil,” the Doctor proclaims. The question for most of the episode’s run time is whether or not that inflexible evil can be changed. Long time fans of the show, and even those who are only a bit familiar with the damnable pepperpots, won’t be surprised by the final answer, but the way the viewer gets there, along with just how the Doctor plays into the Dalek’s final decision, is very well down. It adds to the question that seems to becoming the overarching plot point of the season; is the Doctor a good man? Where Ford’s script lets the viewer down is with how it treats the secondary characters. The soldiers of the Aristotle hospital ship are incredibly one-note, and that’s being generous. The standard of “introducing secondary characters and giving them characteristics before killing them off” will always be the movie Aliens. Into the Dalek introduces every soldier as rough, unyielding, willing to follow orders at a moment’s notice, and willing to threaten to kill the Doctor when things start to go wrong. Even the moment where the soldier Blue decides not to sacrifice them all to kill the Dalek from within is dull and predictable. When one of the soldier’s puts their life on the line to make sure the mission succeeds, the viewer just shrugs and go “ok, ok, move along.” But that soldier does end up having tea with the mysterious Missy, so hopefully when we see them again we might be convinced to care a little more about them. The Daleks themselves…it’s very hard to make them scary anymore. One Dalek is MUCH scarier than a horde of them; see Dalek and Jubilee for concrete evidence of this. Ford keeps the horde of Daleks at their best; an unstoppable, screaming force that blows up everything and exterminates everyone, keeping the Dalek assault during the climax brief and brutal. The individual Dalek itself, “Rusty,” is voiced by none other than Nicholas Briggs, who has been the primary voice of the Daleks for both the revival series and Big Finish. Once again, his voice work is superb, maniacal superiority dripping off every scream and statement the Dalek makes. THIS is the portion of the episode that Moffat wrote. I can tell, because this is the BIGGEST FREAKIN’ CASE of “Show Don’t Tell” gone wrong that I have ever seen outside of that one Rush song. Literally, we’re told in the course of 2 minutes that Pink is a retired soldier, that he’s killed someone, that he feels bad enough about it to cry, and that he finds Clara incredibly attractive with the feeling mutual from her end. This is LITERALLY explained to the viewer without any attempt at subtext or subtlety. This plot point and its delivery/relation to the story at large is done so poorly, it’s could have come from an episode of Hollyoaks. It’s an incredible disservice to the actor, Samuel Anderson, who is on track to become the Doctor’s new companion after Jenna Coleman leaves. It’s a poor introduction that, sadly, will tinge his character until he gets some proper development. Clara Oswald. The Impossible Girl. Or, as I call her now, “Clara Oswald, well-written companion.” In two episode, Jenna Coleman has taken Clara from “flirty, pixie girl love interest” to “grounder of the Doctor’s morals.” She struck me so much in Into the Dalek as channeling old school Sarah Jane Smith in how she acts as the “go-between” between the Doctor and the soldiers as well as taking everything in stride. Gretchen: Is he mad or is he right? Clara: Hand on my heart. Some days he’s both. The Doctor does the heavy lifting, while the companion does the stuff that they never thought they could do but the Doctor knows they could do. That idea has been at the heart of every strong Doctor/companion relationship. Clara has gone from being a seasonal McGuffin to someone who can stand beside the Doctor and isn’t afraid to call him out when he’s not seeing the bigger picture due to his alien nature, and one can see that in the old-series style (non-romantic!) chemistry that exists now between the Doctor and Clara. While I was firmly on the Peter Capaldi bandwagon thanks to the second half of Deep Breath, Into the Dalek sees me shoving the driver over and taking the reins. 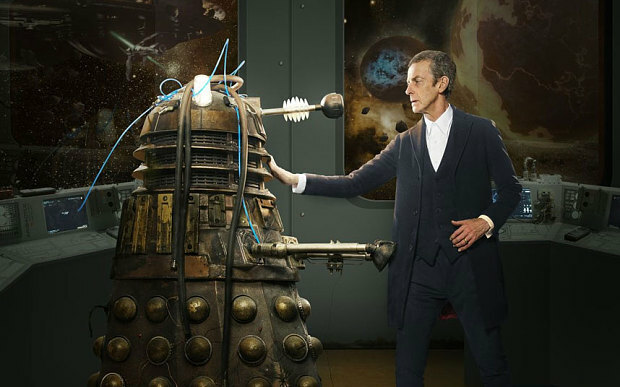 Capaldi’s Twelfth Doctor is absolutely nothing like Ten or Eleven. His pragmatism when he realized one of the soldiers was doomed, and his quick thinking to take advantage of it, showed the new side of this particular Doctor. It’s not that he doesn’t care, it’s that he knows when feelings need to be set aside. But we also see his sense of alien superiority when he chides Blue for threatening him after he rescues from certain death. Throughout the fantastic voyage through the Dalek, the Doctor keeps his hope alive that, maybe, there’s something about this Dalek that will change not only their attitude towards other life forms, but his own perceptions about the Daleks. When he’s proven wrong, the weariness of over a thousand years sets in for a brief moment until Clara literally slaps some sense into him. One of Doctor Who’s underlying themes has always been that one candle in the darkness is better than nothing. One spark of hope can ignite a fire of revolution. The Doctor holds onto this for as long as he can, but when one of the soldier’s offers to sacrifice her life to ensure the Doctor gets that chance, you can see the moment of indecision on the Doctor’s face. Three and Seven, and possibly Four, would have reluctantly agreed, while Two, Six, and Eleven would have probably fought against it. Twelve, though…Capaldi just SELLS the moment. He doesn’t bargain, he doesn’t yell, he just promises to do something good in her name. He dives right into the Dalek’s mind, doing everything to convince the Dalek to maintain its good nature and embrace something beautiful…but the Dalek, in return, sees into the Doctor’s mind. And sees the Doctor’s undying hatred of the Daleks. Nine hears one of his eternal enemies tell him “You would make a good Dalek.” Twelve, after asking Clara if he’s a good man, has a Dalek tell him, after seeing his rage, “You are not a good man. You are a good Dalek.” We’re not being given the Doctor as a near-perfect messianic figures with only a few flaws that everyone loves. We’re being give a Doctor who is wondering about his own existence. Now that the weight of the Time War is off his shoulders, it’s time for the Doctor to have a mid-lives crisis, and Capaldi is the perfect actor to pull such a thing off. Seeing the Daleks so early in the Doctor’s run, Into the Dalek not only gives viewers another look at the iconic foes, but uses them to also give viewers a new look at the Doctor itself, as well as spotlighting Clara’s growth into a strong companion. If it wasn’t for the “blah” secondary characters and heavy handed delivery of foreshadowing, Into the Dalek could have been the best Dalek episode of the revival. Still, it’s a very solid episode and bodes well for Capaldi’s time as the Doctor. Next up – With all of Nottingham at stake, the Doctor must decide who is real and who is fake. Can impossible heroes really exist? Peter Capaldi is the Doctor in…Robot of Sherwood. This entry was posted in Random Thoughts and tagged Clara Oswald, Dalek, Daleks, Doctor Who, Doctor Who Review, Jenna Coleman, Peter Capaldi, Twelfth Doctor. Bookmark the permalink.